Many streamers complain that signing up with different VoDs, like Netflix, HBO GO, Amazon Prime, and BBC iPlayer gets incredibly costly, forcing entertainment-geeks to rely on free solutions. They say, “Fine feathers make fine birds”, and if that is the case than Popcorn Time is an EAGLE for us binge-watchers. However, copyright infringement hunters make life a living hell, urging the use of the Best VPNs for Popcorn Time to stream stress-free! Since it is tough to install the app on your iPhone/iPad though, BestVPN.co has put about 7 hours into writing up this Popcorn Time iOS installation guide. Be prepared to elevate your home cinema experience on your iPhone/iPad devices. There is no doubt that watching movies/TV shows is a great way to kill time, especially after spending a long, tiring day at work. However, the problem with many VoD services is that they have contracts with different production agencies, which only allows them to show specific titles (that are further restricted based on your location). 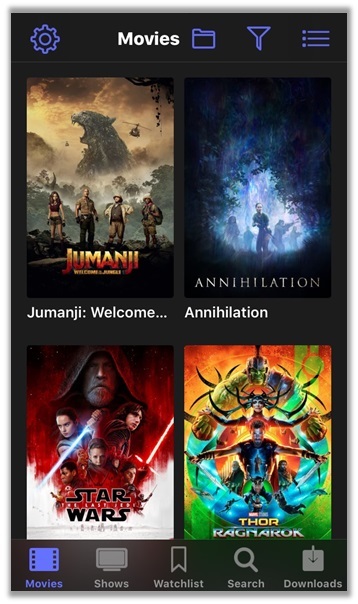 This is where Popcorn Time on iOS makes its entry, as a rising tide that lifts all boats, granting access to titles from all over the world via its P2P-infused media streaming technology. Watch Your Favorite TV Shows/Movies Securely – Since streaming pirated content can get you into legal hassles like paying hefty DMCA fines, using a VPN is imperative to keeping your identity hidden when using Popcorn Time. You can feel assured that your online activity remains anonymous! Bypass Bandwidth/Speed Limitations – Oftentimes, local ISPs may skimp on speeds for certain websites, making it impossible for you to watch content seamlessly. To bypass these bandwidth/speed limitations, VPNs prove incredibly useful, as they allow for streaming in HD while preventing local ISPs from keeping any tabs. Prevents Trackers from Knowing your Location – One of the main benefits of using a VPN for Popcorn Time is that it prevents trackers from seeing your original IP address. 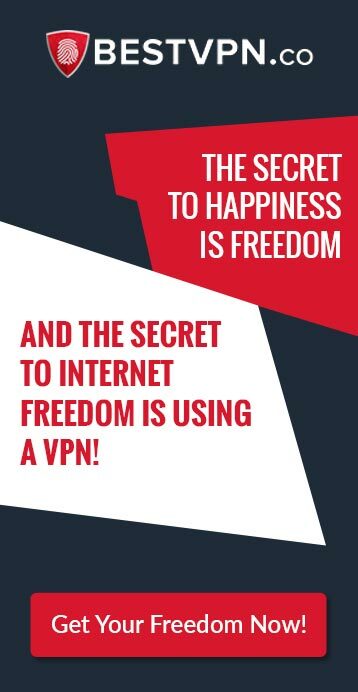 Local ISPs will only be able to see the VPN location you are connected to, which ensures smooth and secure streaming at all times! When it comes to downloading Popcorn Time on iOS, you can simply visit their main websites (Popcorn-time.to and popcorntime.sh). There is an obvious difference between the versions. 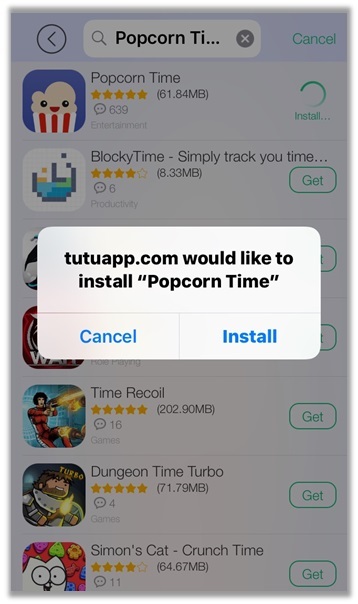 For instance, the .to domain offers a “Popcorn Time iOS Installer”, which enables for easy installation of the app by connecting your iOS device to your PC via a USB cable and then follow the simple instructions. On the other hand, the .sh version just offers a simple .tar file to download and install manually. 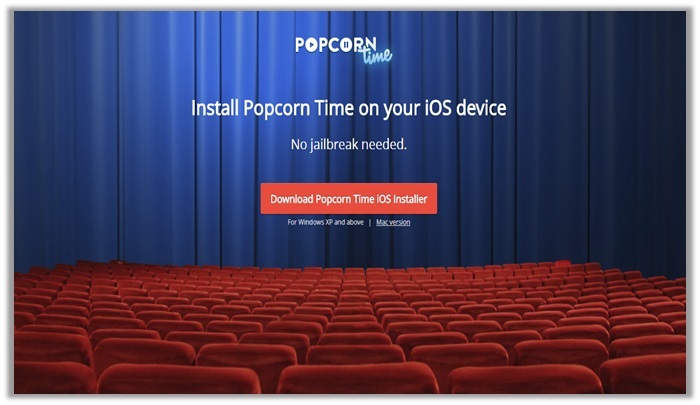 What is Popcorn Time iOS Installer? As the name implies, an iOS Installer is an application for Apple devices (specifically iPad and iPhones), which allows for the downloading/installation of third-party software. Where some may require you to jailbreak your phone, others may just require you to list it in the “trusted apps”. Regardless of the method they use, iOS installers are a crucial tool for getting apps/software, which you may not find on iTunes! When it comes to installing Popcorn Time on iOS, you need to understand that the software is not available on the iTunes store. 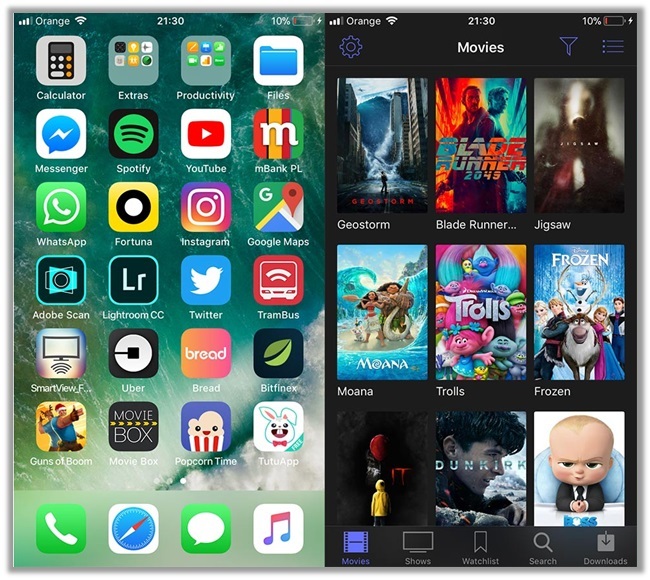 As a result, this means Popcorn Time is an unofficial third-party add-on, which is not in the approved list of applications for your iPhone/iPad. 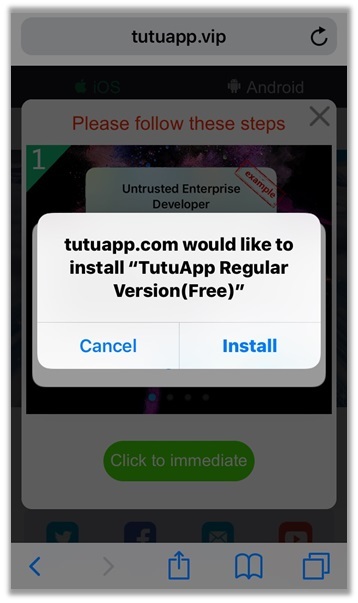 This means you need to rely on software like the TutuApp Helper. Below we provide step-by-step instructions on how to use it for installing PT! 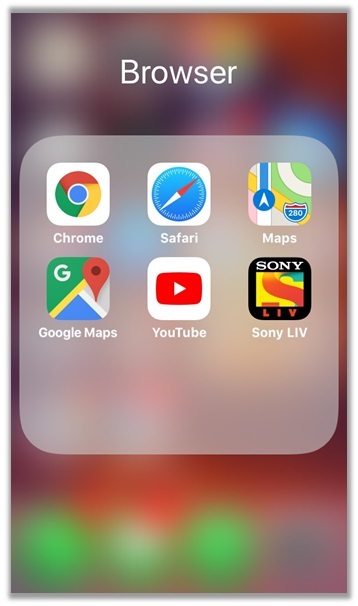 Launch your iOS device and open the “Safari Browser”. 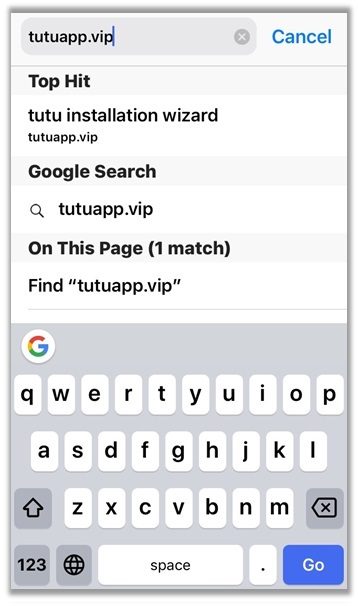 In the URL address bar, copy/paste http://www.tutuapp.vip/ and hit the “Go” button. 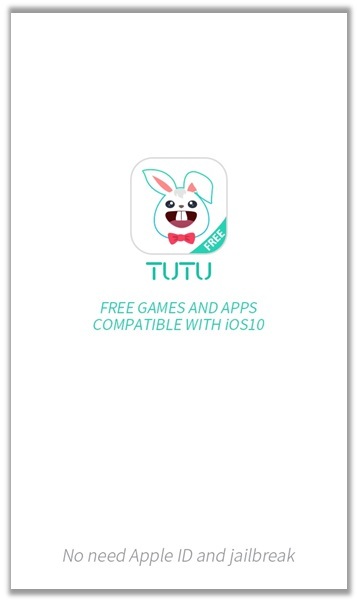 To get the TutuApp, hit the “Download Now” button in green. A pop-up menu will appear. Press the “Click to Immediate” button. 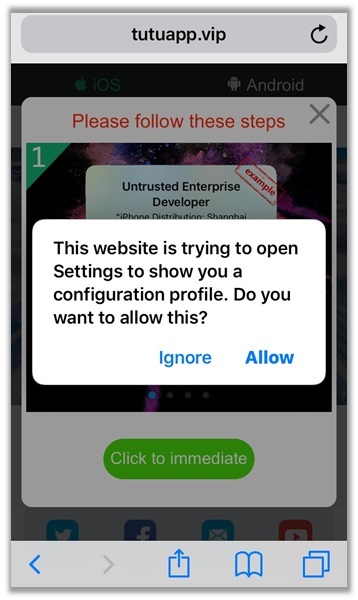 Another pop-up menu will appear for the configuration settings of your iOS. Tap on “Allow”. You will be redirected to the “Device Management” menu. 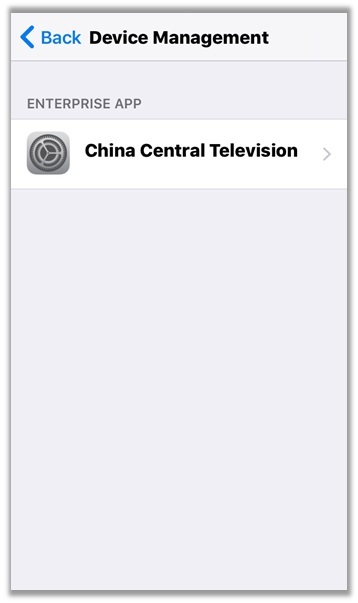 Tap on “China Central Television”. 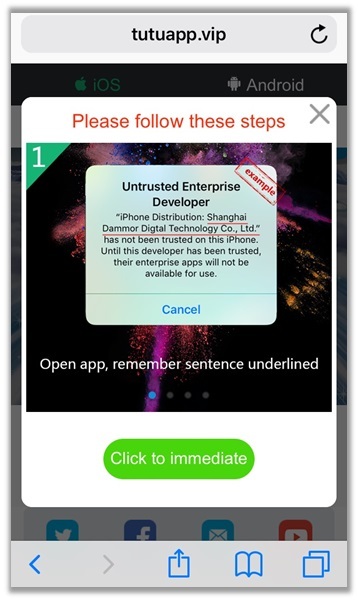 Tap on “Trust” to give the app relevant permissions for use on your iOS device! Hit the “Install” button next to begin the download and app signing process. 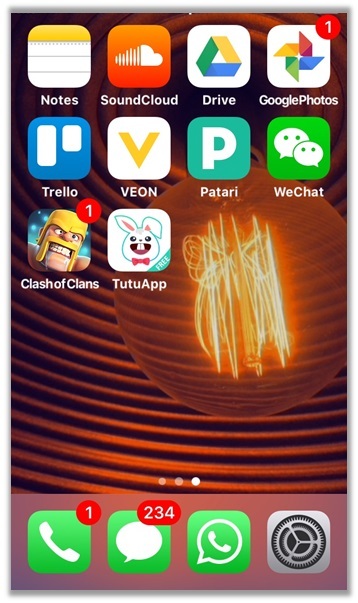 Wait for the TutuApp to download successfully and then tap on the icon. You will see a loading screen. Be patient for the app to load completely. Once the app launches, type in “Popcorn Time” in the search bar and hit the “Get” button. A popup bar will launch. Tap on the “Install” button. Go back to the main menu and tap on “Popcorn Time”. A “Terms of Service” agreement will appear. Tap on “Accept”. Enjoy streaming FREE movies/TV shows via Popcorn Time on your iOS device. 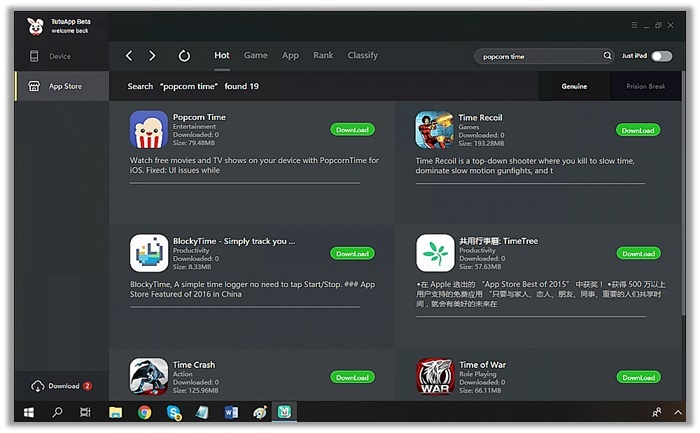 Open your desktop PC, launch any browser, and enter https://www.tutuapp.com/pc/ into the URL. Wait for the software to download. Double-click the .exe file once done to install the application. 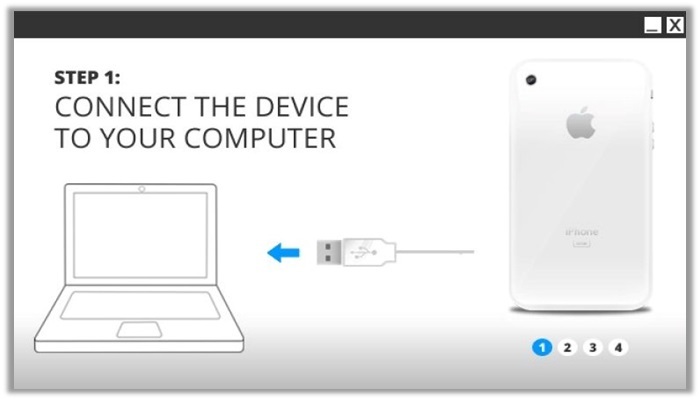 Connect your iOS device to your PC with a USB cable (after TutuApp is up and running). 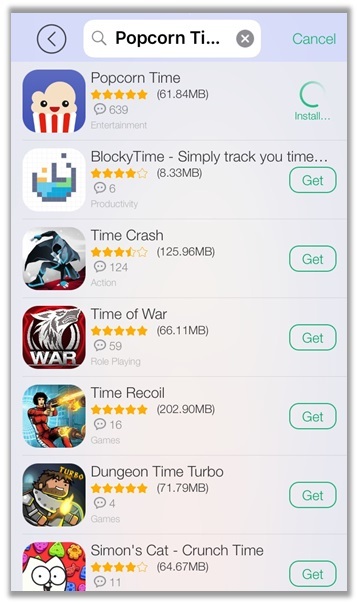 Launch the TutuApp Helper and on the top left corner of the app click on “App Store”. Now, enter “Popcorn Time” into the search bar on the top right corner of the app. 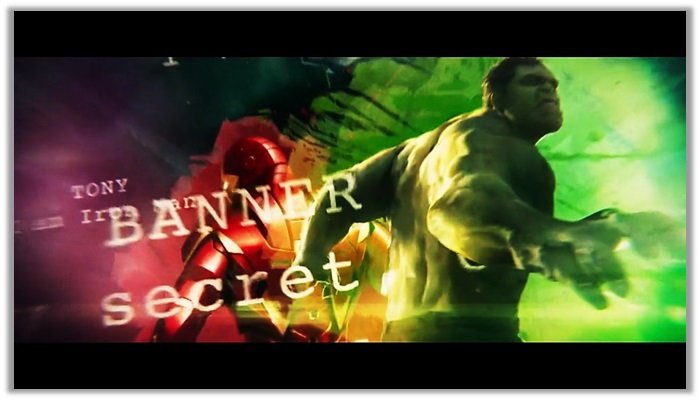 Click on the “Download” button in green, right next to “Popcorn Time” to get the IPA file. 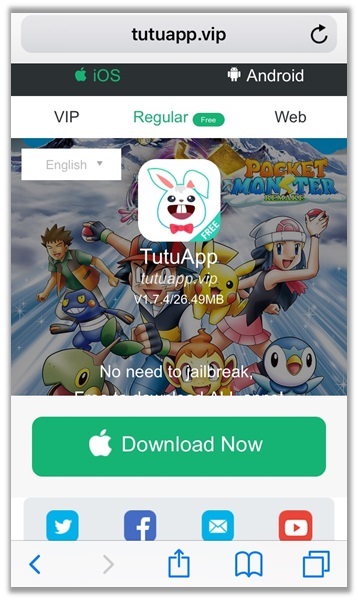 TutuApp Helper will now automatically install the PT app to your iOS device (without jailbreaking or asking for an Apple ID login). Download the Popcorn Time IPA to side load the app on iOS 10. 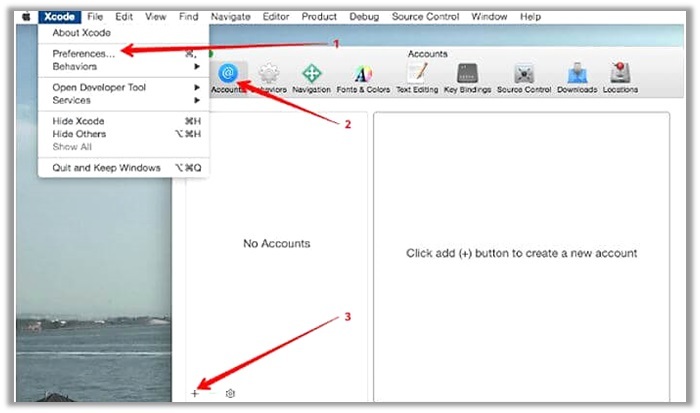 Install the Xcode on your MAC and launch the software. Go to Xcode > Preferences > Accounts . Click the ‘+’button as shown below. Log in with your Apple developer account ID. Copy the Popcorn Time IPA file into Xcode. Connect your iOS device to Mac via a USB Cable. 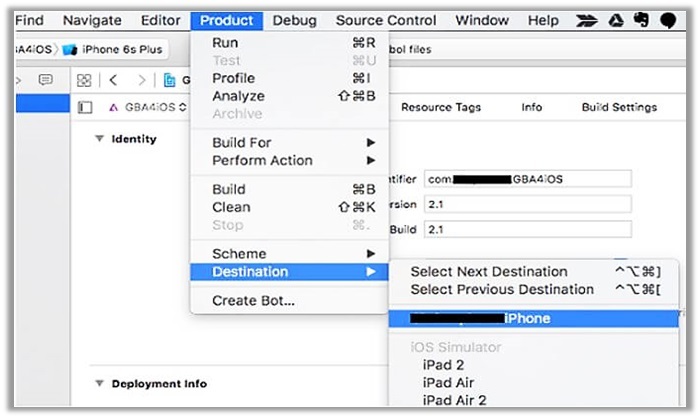 Go to Product > Destination > and then select your iOS Device. Click on “Project” located at the top left panel and change the Bundle Identifier. Enjoy streaming movies/TV shows freely via Popcorn Time on your iOS device! 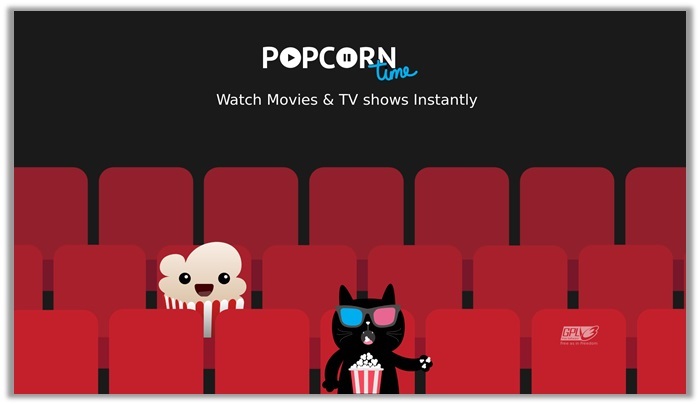 Popcorn Time will now be visible on your home screen. Click on “Publish” from the menu. Upload the cracked IPA version of Popcorn Time. Customize its title and description and set up a password and even enter a custom URL. Visit http://iphonecake.com/ by Safari; it will ask for a password if you had inserted one. Tap on ‘Install App’button and then install once the pop up shows up. Enjoy streaming free movies/TV shows! 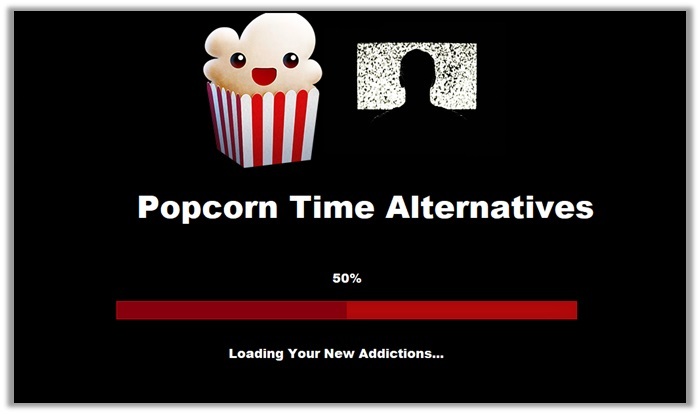 Most people are not aware but Popcorn Time has many different versions available on the internet. The two most famous being the .sh and .to variants, which use the same design/appearance, but load their dedicated software with varied features/tools. For instance, the .to variant comes equipped with an integrated VPN service, which offers in-app security to stream your favorite movies/TV shows. Unfortunately, the .sh version does not offer a VPN service, which means you need to rely on third-party services. 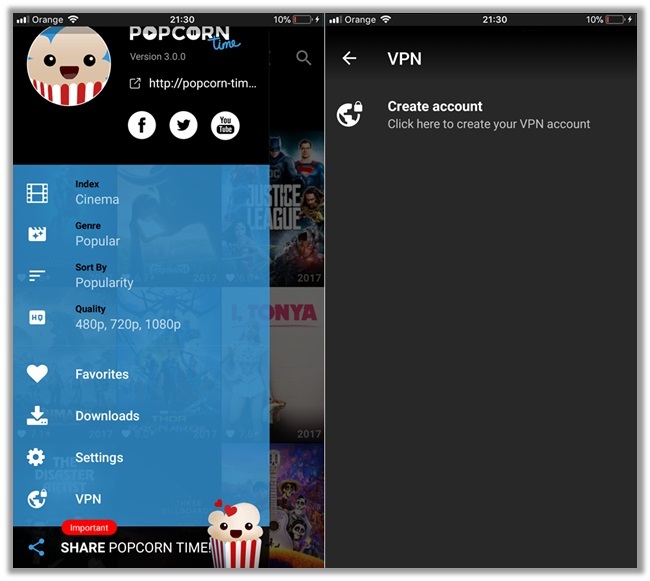 Below is a list of the Best VPNs for Popcorn Time, based on performance, reliability, security, support, server availability and features. Select a provider, sign up for a plan, download their app for iOS, connect to a secure server, and enjoy using Popcorn Time safely and anonymously! Ever since its inception owed to a group of geeks from Buenos Aires, Popcorn Time has been under constant fire by copyright infringement agencies. 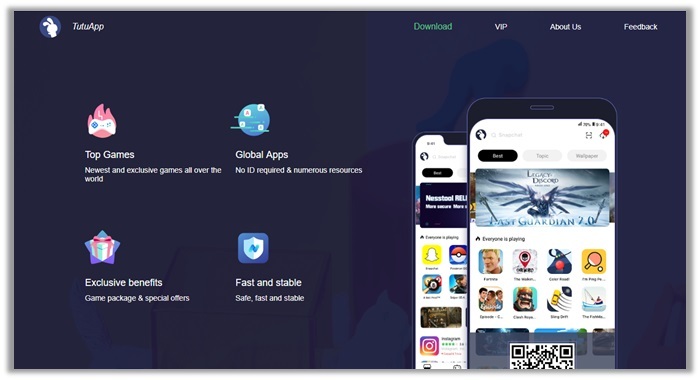 A few days after the app launched, it was involved in a lawsuit that required the original developers to pay damages up to $150,000. When it comes to installing Popcorn Time on iOS, users may have a lot of queries running through their head. In light of this, we decided to create an FAQs section to help our audience out, if they face any trouble! An iOS Installer is an application for Apple devices (specifically iPad and iPhones), which allows for the downloading/installation of third-party software. 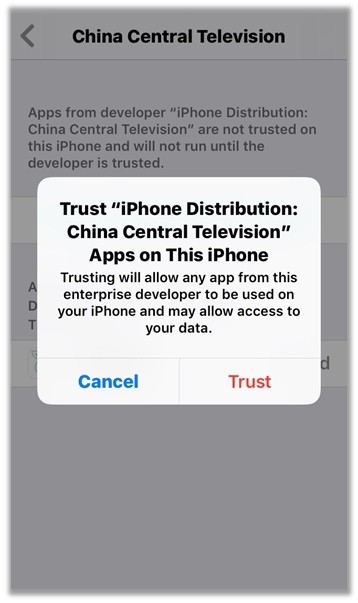 Where some may require you to jailbreak your phone, others may just require you to list it in the “trusted apps”. Popcorn Time iOS Installer Not Working? If you decide to use the iOS Installer for getting Popcorn Time on your iPhone/iPad, you need to have access to a desktop PC. If the software does not work, try checking your firewall settings, or restarting the installer to see if things start working smoothly again. Easy access to entertainment is what most crave in the 21st century, thanks to our fast-paced lives, which restrict average Joes like us from enjoying anything. If you are a corporate slave, who is sick of different VoD services looting you and being biased about the content their offer, then we hope this guide helps you out with setting up Popcorn Time on iOS. Feel free to share it with your friends and family members!